Nashville, TN – The Tennessee Titans offense looked slugish at best Saturday night in their 7-3 loss to the New York Jets at MetLife Stadium. The offense as a whole had problems stopping the blitz. Titans quarterback Marcus Mariota was sacked hard by Jets defensive lineman Leonard Williams. Mariota got right up and went on like nothing happened. The New York Jets took their opening drive 78 yards for a touchdown. Quarterback Josh McCown hit wide receiver Charone Peake with a 4 yard pass for the score. The Tennessee defense stiffened up after this and did not allow the Jets another point. Mariota played the entire first quarter. He completed 2 of 3 passes for 15 yards. He also scrambled once for 6 yards. 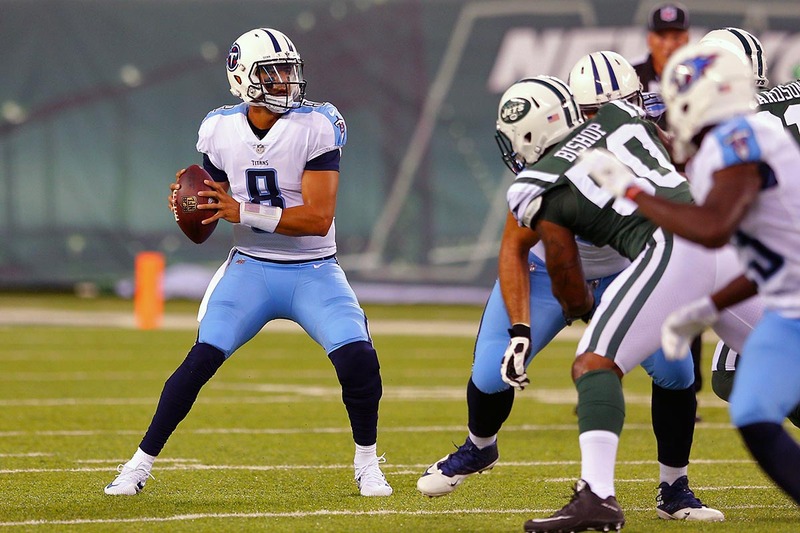 Alex Tanney then came in for Mariota. Tanney was 11 of 27 for 132 yards and an interception. He also ran twice for 28 yards. “I was pretty pleased with Marcus. It was good to see him go to his right the first play, out on an unblocked defender and (he) moved around the pocket really well, made some plays. I was pretty pleased with him,” said Mularky. 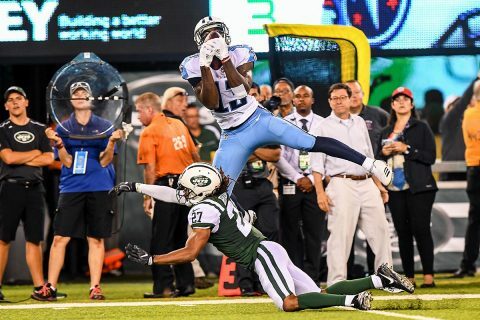 Third round draft pick receiver Taywan Taylor was a bright spot for the Titans. Taylor hauled in four catches for 56 yards. He had one pass that was thought to be a touchdown but was called back to the spot of the catch due to being ruled down. Taylor’s catch set up kicker Ryan Succop for a 36 yard field goal. It would be the Titan’s only points in the game. “Well, that was not the way we wanted to start the preseason, obviously, but there were some good things defensively, if there was anything. Not good offensively even though we still had opportunities to win the game at the end, we just kept finding ways to lose it,” said Mularkey. The Tennessee Titans return home Saturday, August 19th, to host the Carolina Panthers at Nissan Stadium. Kick off is set for 2:00pm CT. Copyright © 2013 Clarksville Sports Network. All rights reserved.